Joe Raedle / Getty ImagesThe bridge was set to be used by 2019. 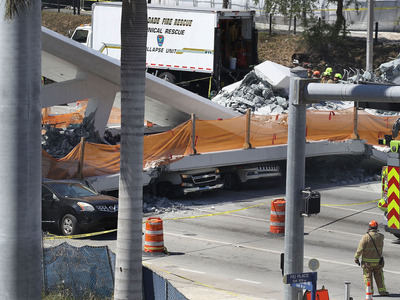 A bridge at Florida International University’s campus collapsed Thursday, trapping people in the rubble and resulting in multiple injuries and deaths. The 950-ton bridge, which was supposed to be ready for use in 2019, was designed to make it safer for students to travel between FIU’s campus and Streetwater, a city where about 4,000 students live. A bridge on Florida International University’s campus collapsed Thursday, trapping people in the rubble and resulting in at least six deaths and nine injuries. 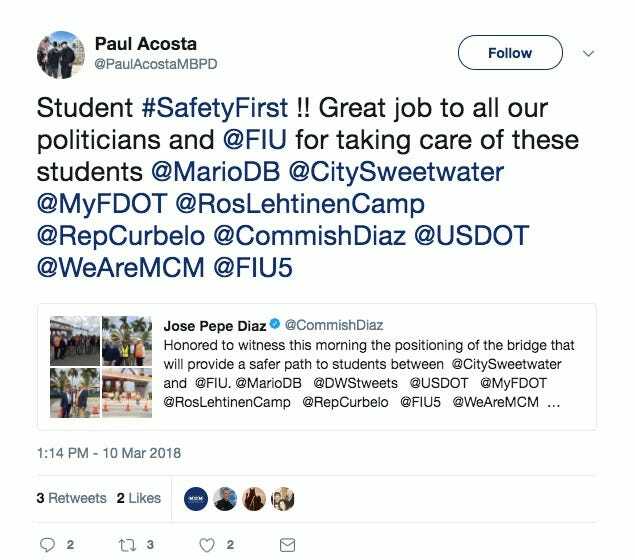 The 950-ton bridge was designed to make it safer for students to travel between FIU’s campus and Streetwater, a city in Miami-Dade County where about 4,000 students live. According to The Miami Herald, students and faculty had asked for a bridge that would span the seven-lane road where a student was killed by a motorist in August. The bridge was scheduled to be used in 2019 and was part of a $US14.2 million project, paid for by the US Department of Transportation, also featuring footpaths, a plaza, benches, tables, and Wi-Fi. “Student #SafetyFirst ! !” one tweet said after the bridge was installed. The National Transportation Safety Board sent a 15-member “go team” to investigate the collapse. NTSB chairman Robert Sumwalt told reporters on Friday that his team will likely stay five to seven days and determine both how the bridge collapsed and how the incident could have been prevented. “Our entire purpose for being here is to find out what happened so that we can keep it from happening again,” he said.